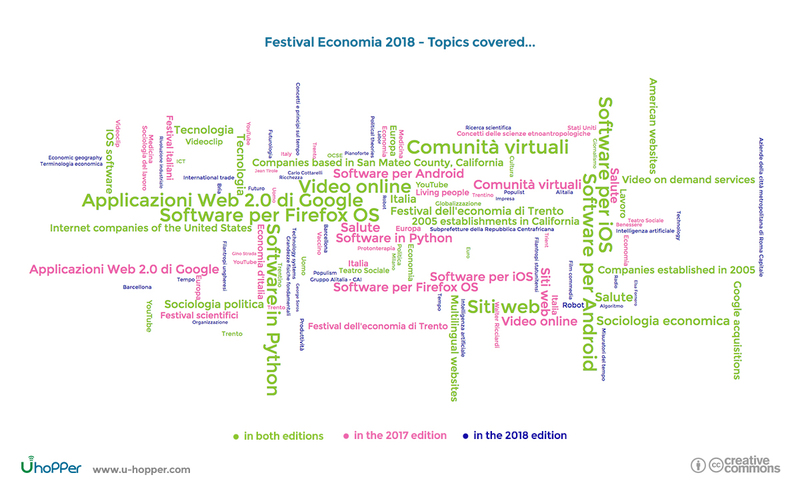 This year the 13th edition of the Trento Economics Festival took place and we at U-Hopper were ready to monitor the Twitter coverage of the event with Tapoi. The main theme of this year’s edition has been Business and Technology and our analysis’ objective has been to verify (and actually confirm) that the social discussion was actually in line with the official focus. 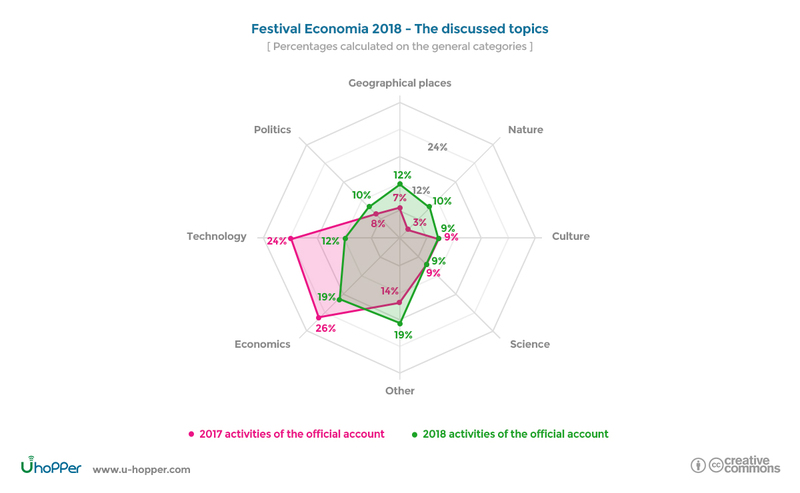 Tapoi analysis reveals that the official Twitter account @economicsfest was particularly active during the event. The comparison with last year’s event data shows that the number of tweets is similar (332 tweets during the 2017 edition). Also aligned the number of mentions and hashtags: the account of Tito Boeri (an Italian economist, currently professor of economics at Bocconi University, Milan) is still in the top 5 while the hashtag usage confirms the main topic change from #salutediseguale (unequal health) to #lavoroetecnologia (business and technology). Moreover, it is interesting to notice how the follower increase was more than double with respect to last year (429 vs. 190 of last year edition): was there an increase in the number of people that are using Twitter, are there more users following the Festival on Twitter? The more interesting insights are coming, as usual, from the analysis of the tweets’ contents provided by Tapoi. In this article we decided to compare this year’s data with last year’s. the dedicated one, that was created by considering the main topics description provided by the event organizers). 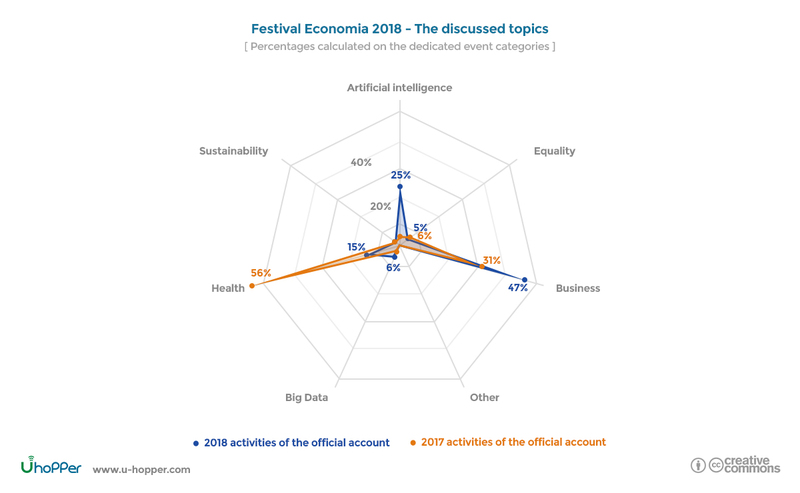 The generic analysis confirms the main topics of the event: Economics and Technology are, in fact, clearly standing out (especially in the 2018 edition). Particular attention was given to Politics during the 2017 edition. Culture and Science result to be aligned. The real confirmation about the preferred discussion topics is given by the analysis with the dedicated model that considers Health, Business, Equality, Artificial Intelligence and Sustainability. The main discussion topics of the last two editions of the Festival appear clear: Health clearly stands out during the 2017 edition (the Unequal Health was actually the main theme) while Business takes the lead in 2018. Artificial Intelligence is also present to confirm the various discussions that are trying to solve those questions that are still without any answers. Is artificial intelligence going to steal jobs from humans? Is software going to think and act as people do? Who is going to be responsible for artificial intelligence errors? There are not only differences between the last two editions of the Trento Economics Festival. Various topic of discussions covering especially technological aspects have been, in fact, covered in both editions. Our monitoring page collects various type of analysis that we performed with Tapoi (not only about the Economics Festival): we suggest you take a look at it! This article allowed us to present once more how Tapoi can be used to monitor and analyze one or more social accounts allowing to get key data and insights. This can be used in order to adjust the social presence of a brand or drive a social advertisement campaign. Next Post Next Post: Social profiling is dead (thanks to GDPR): long life to social profiling!